Above - The Main Frontage of the Pavilion Theatre, Bournemouth in February 2019 - Photo M.L. The Bournemouth Pavilion occupies an acre of the town's most imposing seafront land. 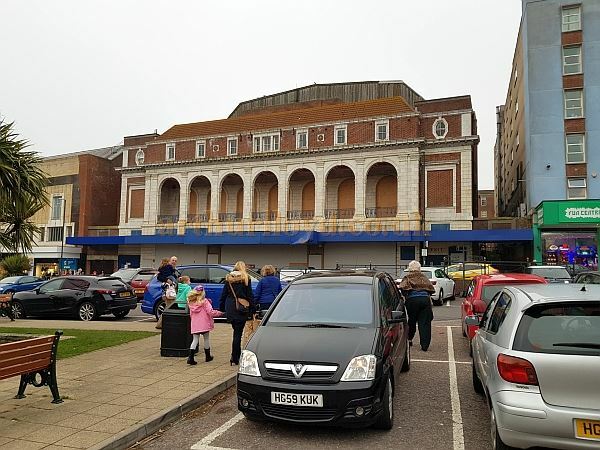 It's main frontage is on Westover Road, but the rear of the building, which houses the Pavilion's Ballroom, also has an imposing facade looking over the seafront. The western elevation looks over Bournemouth's landscaped pleasure gardens. The Pavilion was constructed by Jones & Sewand Ltd., and was originaly designed by the architects G Wyville Home and Shirley Knight. It was built in the 1920s at a cost of £250,000, and consisted of a large concert hall, later converted for theatrical use in 1934, a large Ballroom, and the Lucullus restaurant. Right - An advertisement for the Gala Opening of the Bournemouth Pavilion in March 1929 - From the Western Gazette, 1st March 1929. 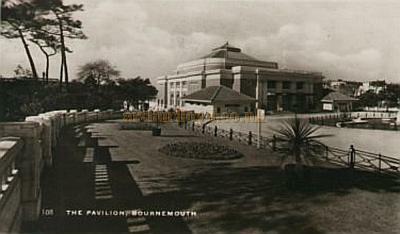 Work began on the Bournemouth Pavilion in 1924 when the site was cleared for its construction. The Portsmouth Evening News reported on this in their 15th of December 1924 edition saying:- 'The work of clearing the site for the Bournemouth Pavilion proceeds apace. All the buildings on the site have been virtually demolished except a portion of "Tachbrook," which the contractors are using for offices. Gangs are now getting out gravel and serving other gangs, who are mixing the concrete required for putting in the foundations. Immediately behind the Belle View Hotel a deep line of trench has been dug, and the timbering is in position in readiness for the first section of the foundations.' - The Portsmouth Evening News. The Pavilion took four years to construct and was formally opened on Tuesday the 19th of March 1929 by the Duke of Gloucester who had travelled from London in a reserved compartment of a special excursion train. The Duke was entertained by the first concert to be performed in the new Pavilion's Concert Hall after a lunch where he was presented with a gold cigarette box by the Mayor. The Duke said in a speech at the opening, which was broadcast live to 2LO and other radio stations, that Bournemouth was the "Acting Physician to the industrial towns, bringing health to the sick, vigour to the convelescents, and being a playground to those in full health." The Souvenir Brochure for the opening of the Regent Theatre can be viewed here. Above - Everyone involved with the opening of the Bournemouth Pavilion poses for a photograph in front of the new Theatre in 1929 - From the personal collection of Alec Marlow - Courtesy Phil Davis. 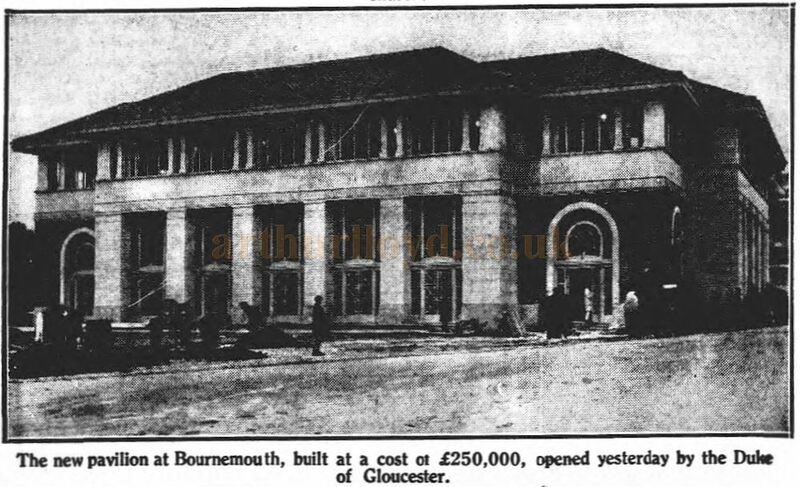 Above - The new Pavilion at Bournemouth - From the Sheffield Independent, 20th March 1929. The Sheffield Independent reported on the new Pavilion in their 20th of March 1929 edition saying:- 'One of the most striking features of the new Pavilion is the ballroom, where there is a perfect floor and interior decorations consisting largely of a series of mural paintings showing different dances. 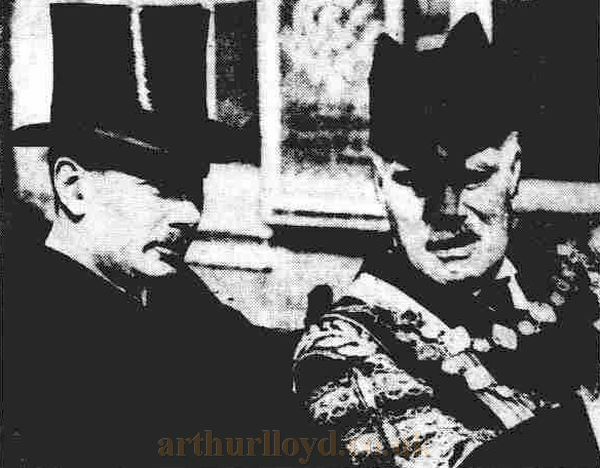 Right - The Duke of Gloucester with the Mayor of Bournemouth driving to the new Bournemouth Pavilion which he opened yesterday - From the Sheffield Independent, 20th March 1929. The hall will hold 500 people, and the south-west side is almost entirely composed of windows commanding a view of the sea, the pleasure gardens, and the distant Purbeck Downs. The hall	contains what is believed to be the largest soda fountain in the South of England, and adjoining the ballroom is the "Lucullus restaurant." 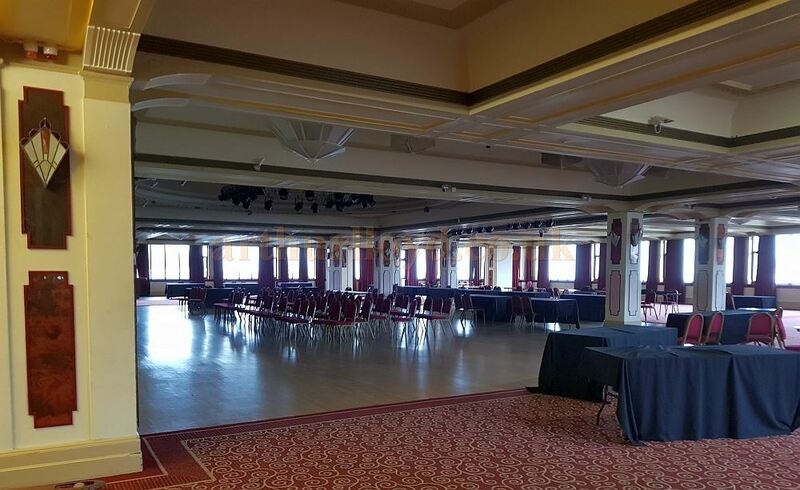 Above - The Bournemouth Pavilion's Ballroom in February 2019 - Photo M.L. The huge concert hall is remarkable for the ease with which the stage can be seen from any part of the house. This is due to the construction of the balcony on the cantilever system, which allows a clear view of the stage, unobstructed by any supports or pillars. The walls are mainly of rose pink, and the ceiling is of cream decorated with golden stars and mouldings. The Pavilion will appeal to the most varied tastes of holiday makers, and should be the culminating attraction of Bournemouth. The entire outfit of plate and cutlery in the Pavilion has been provided by Messrs Mappin and Webb, Sheffield.' - The Sheffield Independent, 20th of March 1929. 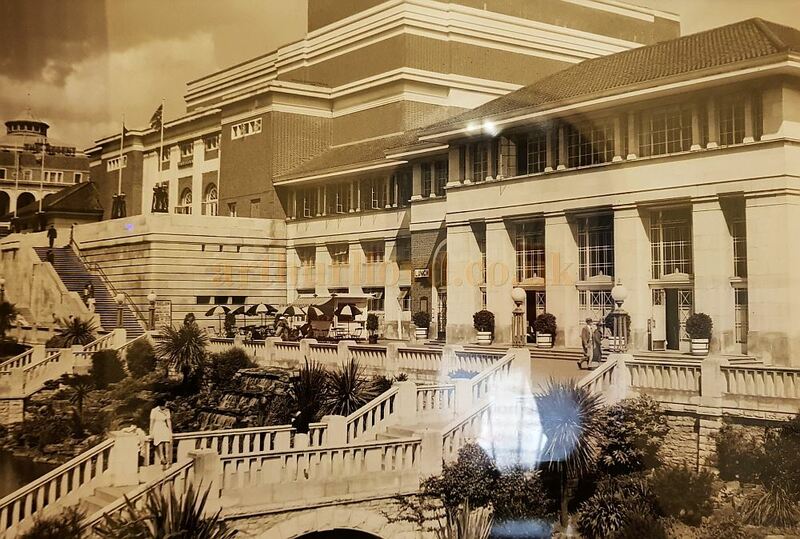 Above - The Bournemouth Pavilion in a photograph displayed in the Theatre's foyer, probably from the 1930s. In 1934 the Concert Hall part of the Pavilion was altered for live theatre by the addition of a fly tower and a larger stage, with a revolve and stage lift, it reopened as the Pavilion Theatre on Saturday the 7th of July 1934 with Prince Littler's touring production of 'White Horse Inn' and a seating capacity of over 1,500. Right - An advertisement for 'White Horse Inn', the reopening production at the Bournemouth Pavilion in July 1934 - From the Western Gazette, 13the of July 1934. 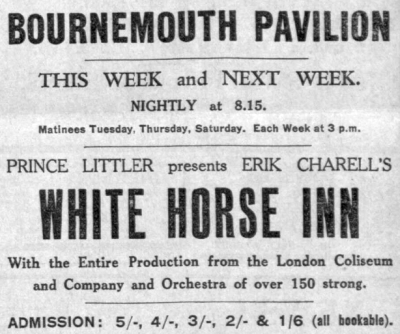 The Stage Newspaper reported on the reopening in their 12th of July 1934 edition saying:- 'After having been closed for several weeks for the rebuilding of the stage as well as other improvements, the Concert Hall of Bournemouth Pavilion was reopened on Saturday with the presentation of "White Horse Inn," which continues there for two weeks. The dimensions, etc., of the new stage are as follow: Opening 45 ft.; extreme width, 85 ft.; depth, 42 ft. 6 in. ; height from floor to grid, 48 ft.; and diameter of revolve, 36 ft. Thus the Pavilion has one of the largest stages in the provinces. There is said not a larger revolve outside London, and for the first time Bournemouth has a stage that is perfectly equipped in every respect. 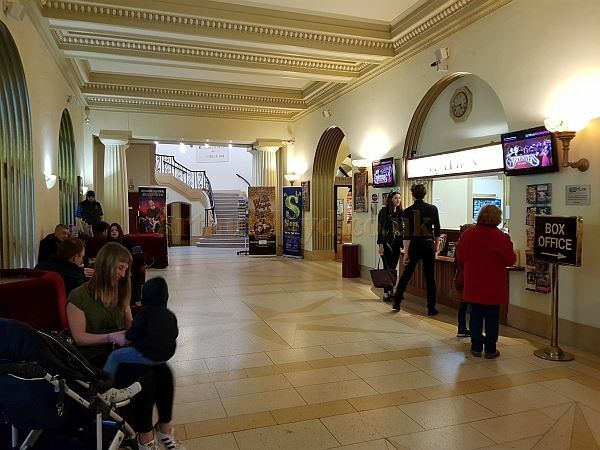 Left - The Foyer of the Bournemouth Pavilion Theatre in February 2019 - Photo M.L. There are nineteen dressing-rooms, providing accommodation for 150 artists. The orchestral well has been completely reconstructed. It provides ample accommodation for forty-eight musicians. The organ has been modernised, and a when completed will possess features that few other organs have at the present time. The stage, corridors, and dressing-rooms are all equipped with automatic sprinklers, which, together with the fireproof curtain and the additional exits, make the building as safe as it is possible for it to be. 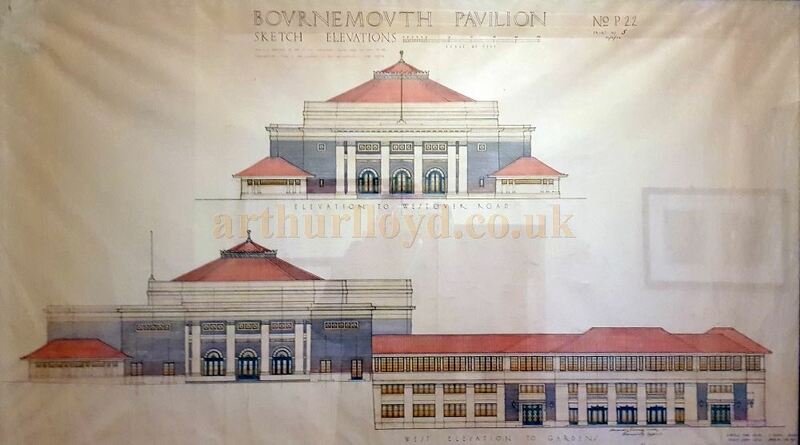 Above - Architect's Elevations of the Bournemouth Pavilion displayed in the Theatre's foyer today. The above text in quotes was first published in the Stage Newspaper, 12th of July 1934. 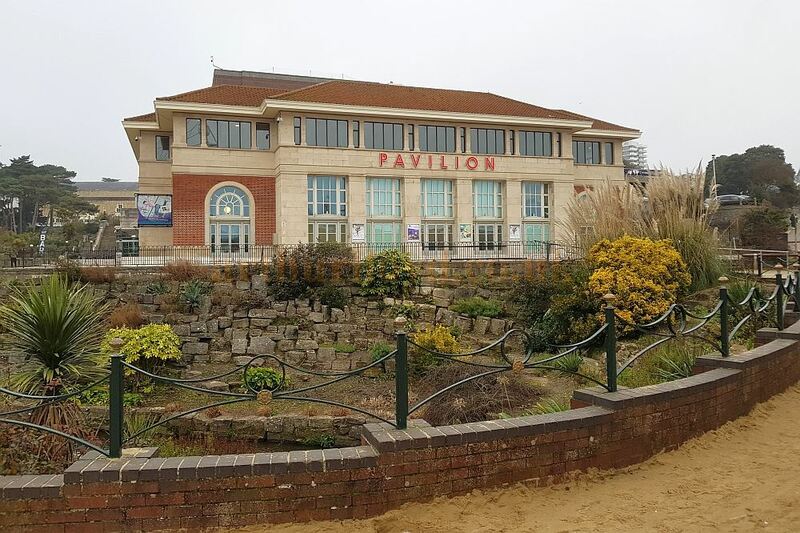 Above - The Rear Elevation of the Bournemouth Pavilion in February 2019 - Photo M.L. 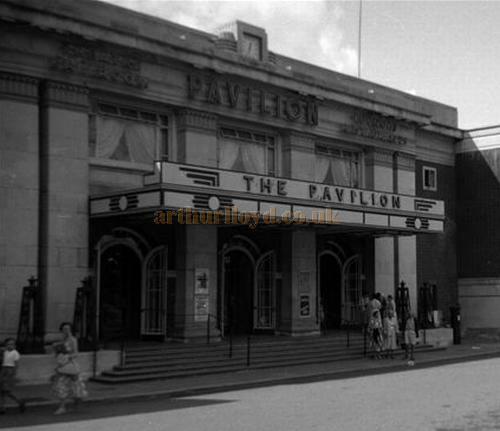 The ERA also reported on the reopening of the Pavilion, in their 18th of July 1934 edition saying:- 'The structural work which has necessitated the closing of the Bournemouth Pavilion for some time is now completed, and the building was re-opened on Saturday, July 7. The new stage has an opening of 45 ft., a total width of 85 ft., and a depth of 42 ft., with a revolve of 36 ft. diameter, which is the largest revolving stage in the provinces. There are nineteen new dressing rooms, and the new lime-box at the back of the theatre is the largest and most complete in the country, and, if necessary, can floodlight the whole stage without the use of the footlights. 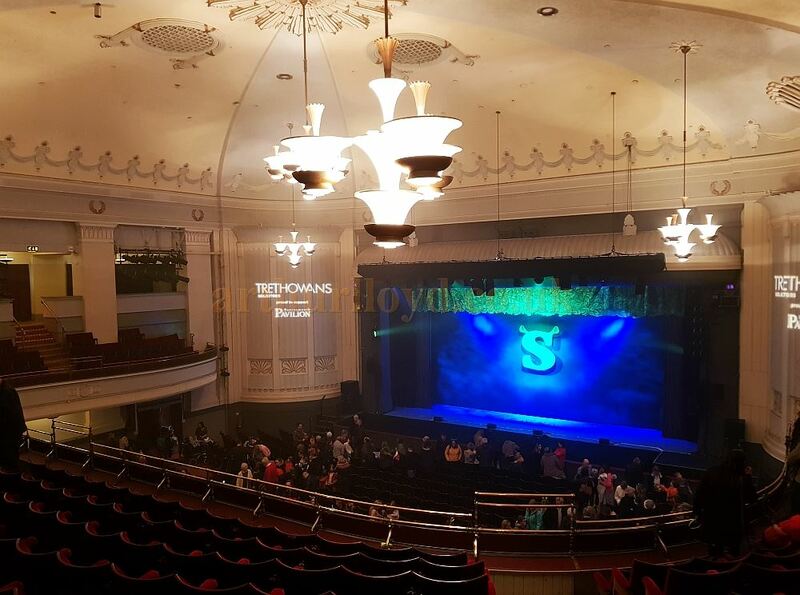 Above - The Auditorium and Stage of the Bournemouth Pavilion Theatre during the run of the touring production of 'Shrek the Musical' in February 2019 - photo M.L. The production was first produced at the Theatre Royal, Drury Lane in June 2011. The orchestral lift is rapid and silent, and allows the conductor's rostrum to be raised or lowered independently. The new switchboard gives over a quarter of a million candle power of light on the stage, and the most modern machinery for operating the scenery is installed. All the seating in the auditorium has been re-spaced, giving more knee room. The above text in quotes was first published in the ERA, 18th of July 1934. 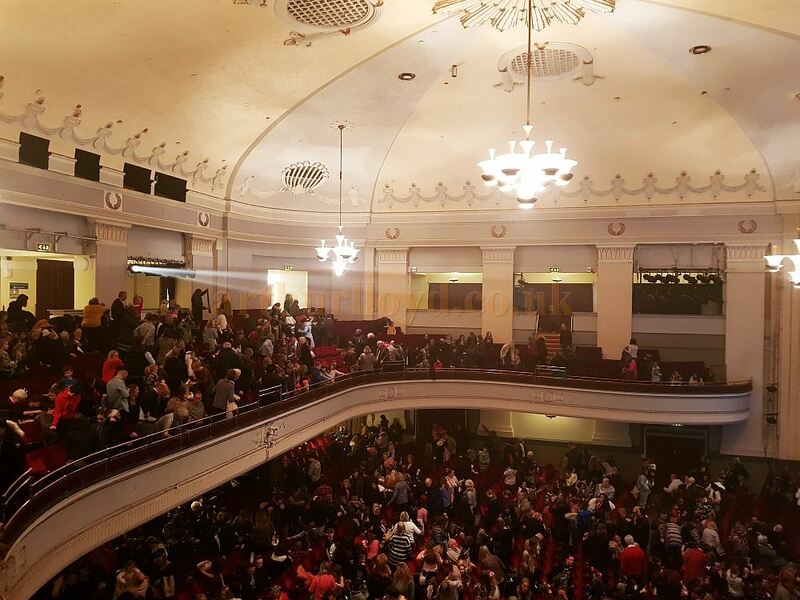 Above - The Auditorium of the Bournemouth Pavilion Theatre during the run of the touring production of 'Shrek the Musical' in February 2019 - photo M.L. The production was first produced at the Theatre Royal, Drury Lane in June 2011. 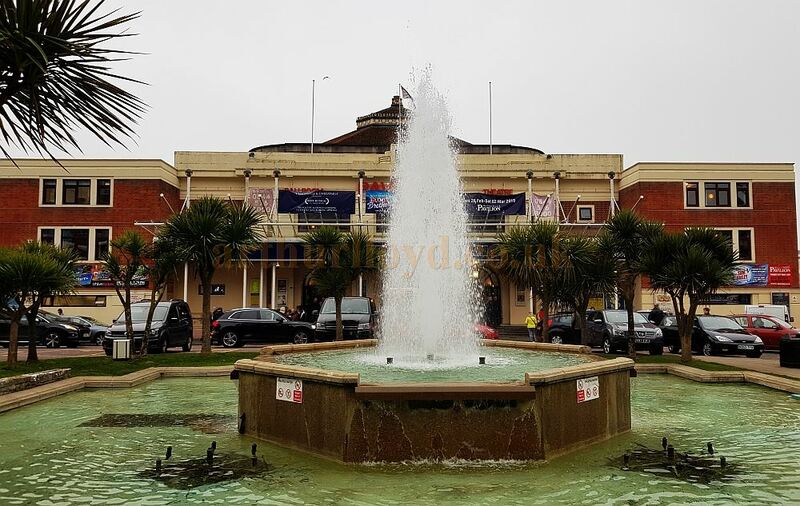 The Bournemouth Pavilion has been a very successful seaside Theatre for decades and, along with several further enhancements over the years, has continued to entertain locals and visitors alike with West End touring productions, Opera, Ballet, Pantomime and Comedy productions. And its large Ballroom space regularly hosts gala dinners, fashion shows, conferences, and exhibitions. For more information on the Pavilion Theatre you may be interested in reading Donald Auty's Summer Spectacular at Bournemouth Pavilion in the 1960s below. You may like to visit the Grade II Listed Pavilion Theatre's own Website here. The Pavilion theatre Bournemouth was built in the twenties and was intended to stage spectacular shows and this it did in an expert and lavish manner. The stage is deep, the flys counterweight, and it was one of the first theatres in the country to have an electronic valve controlled lighting board. To add the final icing on the cake it has a revolving stage and the orchestra pit is on a lift so that it can be raised to the level of the top of the orchestra pit rail when the band strikes up the overture. During the thirties it was one of the most modern theatres in the country. The auditorium on two levels is more functional than ornate but that was the art deco style of the times. With a seating capacity of just over 1,500 it was an ideal size for the times but a little small for the big musical of today. Harold Fielding, the great West End producer, was responsible for the summer shows and I was fortunate to stage manage two of them. The first starred Ken Dodd and Alma Cogan and a number of international specialty acts including Kazbek and Zari an adagio act where the male partner wielded a whip and as well as the spectacular lifts and throws spun his female partner on the thong and appeared to flay her with it. Kazbek was very skilled. To the audience it appeared that the girl was being thrashed but never a slight welt appeared on her body from the whip all the years I worked with them. There were however plenty of injuries on both sides from fights and arguments that constantly erupted off stage. The sadistic masochistic element of the act was also present in real life and I had to break up many a bloody fight. We had a spectacular cruise scene where a gigantic liner on a wipe track crossed the stage and dissolved into an on deck scene that ended with a storm and the deck pitched and tossed. 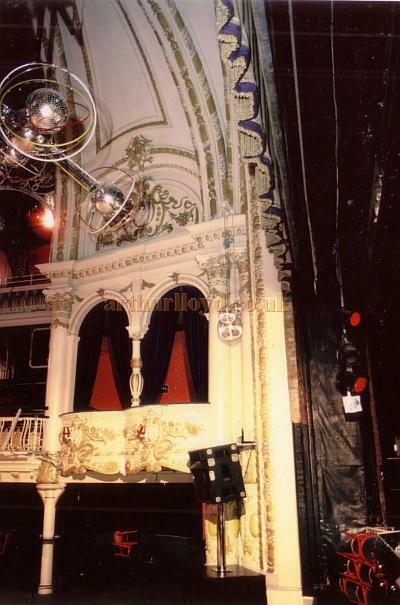 We also had a tilting mirror that was flown at an angle over the stage for a spectacular ballroom scene and the audience saw an over head image of the dancers as well as that on stage. Unfortunately the mirror was very heavy and it got dropped during the get out and caused a lot of damage to the stage. Harold Fielding was not best pleased. The second show starred Joan Regan and we had a spectacular water scene based on the war time dam busters incident and the dam used to burst and hundreds of gallons of water used to rush down shoots at the front of the stage. Fortunately for all of us the orchestra pit lift had to be at its lowest level for the water, which was really not in such great quantities as it appeared to be, to circulate through the system. You really saw the same lot of water time and time again. But there was still quite a lot of water. On the technical dress rehearsal with the orchestra in the pit the dam duly burst but the circulation system for the water got blocked and hundreds of gallons of water poured into the orchestra pit and I have never seen a band depart so quickly not even if the curtain came down two minutes before the pubs closed. The director Joan Davis who was a very good friend of mine decided that I had purposely allowed the dam to burst into the orchestra pit and screamed at me "Don why have you let all that ********** ~~~~~~~ ####### ********* water go into the ************* ~~~~~~~~~~~~ ############ *********** orchestra pit?" and this continued for a least two minutes until Harold Fielding stood up and shouted "Joan now that is enough Don has not been down there and personally stuffed his dirty socks into the circulation system". The rehearsal had to be abandoned and Bob Probst the Musical Director and myself spent the rest of the evening with bare feet and trousers rolled up fishing for band parts. The safety curtain has to be lowered by law and then raised in the sight of the audience. This usually happens during the interval. One night the orchestra pit was up at its highest level with the band playing the second half opening music. When it was the cue to raise the safety curtain it would not budge, it was as though riveted to the stage. The band busked away for 15 minutes and the comic went out into the audience to keep things going but the safety curtain would not move until John Laurie, the brilliant Scottish resident stage manager, came up with idea of raising the safety curtain by using the orchestra pit lift as a counterweight, and it worked, up came the safety curtain and down went the orchestra to the lowest depths of the pit and the show went on." What will happen if there is a fire?" someone asked John. He answered" You will see the quickest appearance of a band with their false teeth on the floor that has ever happened in ********** theatre history." The valve operated lighting board could be a problem at times. If a valve blew you could not do a black out until someone dashed under the stage to the valve room and replaced the blown valve. Alec the chief electrician became very proficient at the hundred yard sprint. George and Alfred Black took over from Harold Fielding as producers of the summer shows in 1964. These brothers were wonderful people and steeped in every aspect of variety. Their father George Black senior had been been managing director of the London Palladium and Moss Empires and had made them the premier theatres in the world. They were affectionately known to all as 'the boys' because of their late father, though both were well over fifty by this time. The shows had to be top on all through the run I have even known them replace an entire set of costumes during the last week of the season if they had started to look less than fresh and new. They were the best producers I ever worked with. And were not in the least snobbish, you were treated as part of the family as long as you knew your job. One morning we were doing a dress technical rehearsal and I was, in addition to working the prompt corner, changing the gelatine colour filters on the stage lamps because we were short of staff and this meant I was rushing around the stage and the boys were sat in the stalls bursting themselves with laughter and shouting out go on Don we've just put £20 on you to win. This went on for about half an hour until Alf walked up the stage run out steps and said O.K. Don you work one side of the stage I will work the other. You would not find a producer who would or could do that now days. We did concerts every Sunday with a different bill to that of weekdays with top stars such as Yana Russ Conway Jessie Mathews and Frankie Vaughan. These were lit and presented as top class variety bills even though we only had a three hour band call in the afternoon to do it. This was the time that the rock and roll groups were on the scene and just starting to come into the Theatres. We had one such group booked in one Sunday who shall be nameless and Alf happened to pop in for a drink just before the first half started and this group had not shown up yet. I had one of the weekday acts standing by to deputise just in case. Alf was in a relaxed and happy mood so I did not want to spoil it for him by telling him of my problems.. He put down his glass in the bar and said "Well Don I suppose I had better say hullo to this bloody group we have to be quite frank I've never heard of them." "Oh," I said, "I think they are out eating somewhere". He seemed to be quite relieved not have to meet them and ordered another pint. Eventually I told him what had happened and the arrangements that I had made, "Be a better bloody show," he said. During the first house Interval he and I were standing by the stage door having a cigarette when this clapped out old transit van pulled up and a head peered out of the window and said "ere mate is this the Pavilion?" I said yes it was, "Thank god for that" was the reply, "we've been looking for a ******** ballroom." It was the group. Alf looked at me through glazed eyes and quickly retreated to the circle bar. The group were loud and the girls in the audience all screamed and rushed down to the orchestra pit rail and I went up to the back of the circle to cut the sound volume by half. Alf was standing at the back of the circle leaning over the back rail. He put his arm round me and said, "Bye Bye Don see you the last night of the season." And he stuck to his word which was a great pity. The above article on the Bournemouth Pavilion was written for this site by Donald Auty in 2003. 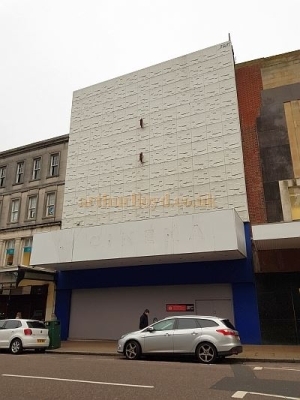 Above - The former Regent Theatre, Bournemouth, closed and boarded up, in February 2019 - Photo M.L. The Regent Theatre was designed by the prolific Theatre and Cinema designer William Edward Trent, assisted by Seal & Hardy, for the Provincial Cinematograph Theatres chain, and opened on the 13th of May 1929 with the film 'Two Lovers', a silent film, although the Theatre was also wired for sound when it opened. There was also a variety show on the Theatre's stage. The Regent Theatre was situated directly opposite the Bournemouth Pavilion, which had opened two months earlier, and was built primarily as a Cinema although it did have full stage facilities, it was also equipped with a Wurlitzer Theatre Organ, played at the opening of the Theatre by Reginald Foort, and it also had a large Restaurant, a Theatre Manager's Flat, and an auditorium decorated in the French Renaissance style, capable of seating 2,267 on two levels, stalls and one circle. The ERA reported on the opening of the Regent Theatre in their 22nd of May 1929 edition saying:- 'Bournemouth's newest place of entertainment, the Regent Theatre, was opened on May 13th. The opening ceremony was performed by the Mayor, Alderman C. H. Cartwright. J P., and there was a large attendance of representative townspeople. 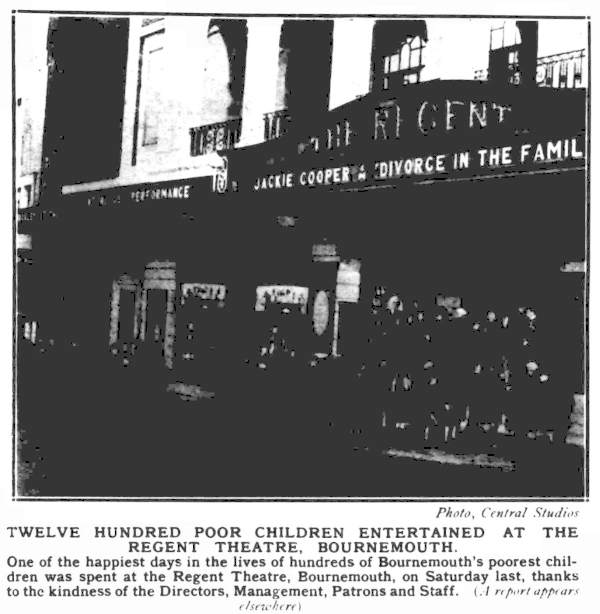 Right - Twelve Hundred poor children entertained at the Regent Theatre, Bournemouth - From the Bournemouth and Southampton Graphic, 30th December 1932. The new Regent is the enterprise of the Provincial Cinematograph Theatres, Ltd. The new building expresses its purpose in a manner imposing but dignified, and suitable to its setting. The arcaded front with its deep shadows showing in sharp relief against the gleaming white terracotta crowned by pleasing red brick and the bold red ties of the roof, forms a pleasing composition in combination with the ornamental gardens of the Corporation Pavilion. The wide central entrance and the bronze and glass marquise suggest the house of entertainment, while a touch of gaiety is lent by the flag poles and the brilliant coloured ceiling over the cafe logia. The whole building is crowned by a flat copper dome. The interior has also been treated throughout in the stye of the Italian Renaissance. The auditorium has accommodation for 2,300 persons and gives the impression of spaciousness without sacrificing the note of comfort and intimacy. The theatre was designed by Mr. W. E. Trent. F.S.I., architect to the company. It is stated there is no kind of entertainment which cannot be presented, be it the silent or talking film, the musical turn, orchestral selection, review or stage play. The theatre is wired with the Western Electric Apparatus and a number of talking and singing films have already been booked. 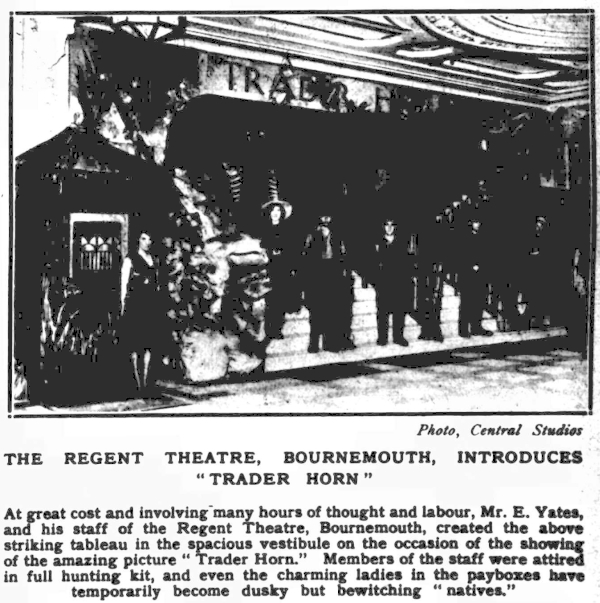 Left - The Regent Theatre, Bournemouth introduces "Trader Horn" - From the Bournemouth Graphic, 18th September 1931. The programme for the opening was of a very attractive character, the big picture being "Two Lovers," with Ronald Colman and Vilma Banky in the leading roles. The variety portion of the programme included the first presentation of "Something Different," comprising the Regent Girls, a clever troupe of nine acrobatic dancers, Graham and Douglas, two simultaneous dancers, and Nan Foster, the popular ballad singer. Mr. Reginald Foort was at the Wurlitzer Organ, and Mr. T. S. Clarke Browne led the Regent Orchestra of twenty four members, in the musical interlude. The above text in quotes was first published in the ERA, 22nd of May 1929. In August 1949 the Theatre was renamed the Gaumont Theatre after its owners Gaumont British, who had actually taken over PCT shortly before the Theatre opened in 1929. Gaumont closed the Theatre in November 1968 and then set about converting it into a twin Cinema, reopening it on the 15th of July 1969. Right - The former Regent Theatre, Bournemouth, closed and boarded up, in February 2019 - Photo M.L. From October 1986 the Theatre's name was changed to Odeon and they then later converted the downstairs cinema in the former stalls area to 4 screens which opened in June 1989. Another screen was later added in the Theatre's former restaurant area, bring the total to 6 screens, the largest of which was still the 757 seat Odeon 1 situated in the former circle of the Theatre. Sadly Odeon closed the whole building down in February 2017 when they opened their new modern complex in the BH2 Leisure Centre on Exeter Road. The Westover Road Odeon was then apparently bought by Libra Homes, along with the nearby ABC Cinema (shown left) for £6.5 million, who hoped to convert the former Odeon into a mixture of flats and shops, but planning permission was refused, and the Theatre remains closed and boarded up at the time of writing in April 2019. Left - The former Art Deco Westover Super Cinema, later the ABC / Cannon / MGM / ABC, in a photograph taken in February 2019. 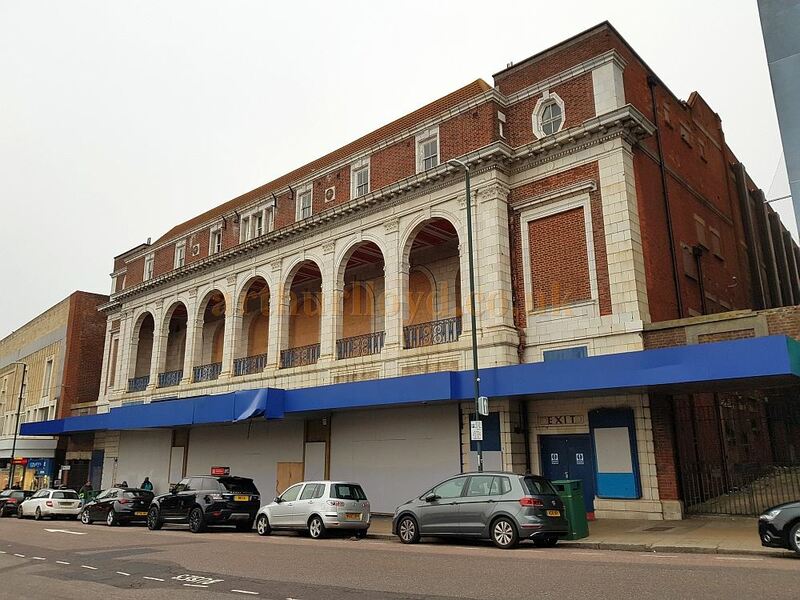 The Cinema is situated on Westover Road, Bournemouth and was designed by William Riddle Glen, opening on the 19th of June 1937 with seating for over 2,500 people. The Cinema was completely closed down in January 2017 after a final showing of the 1980s film 'Back to the Future', along with the nearby Odeon Cinema. The future of both Cinemas is at the time of writing in April 2019 very uncertain. 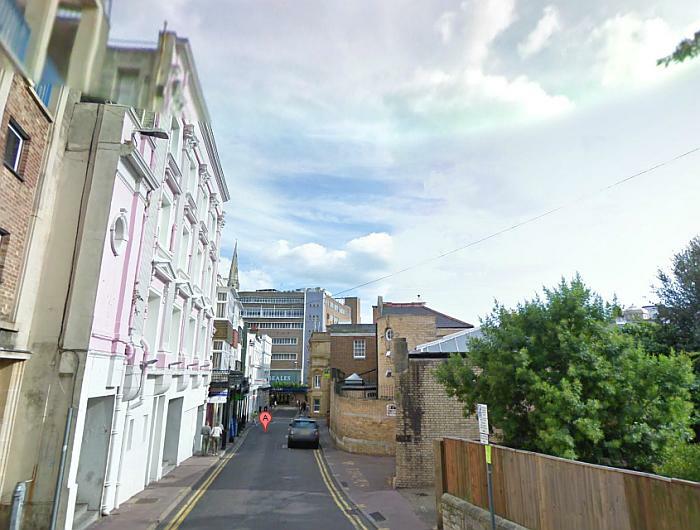 Above - A Google Streetview image of the former Theatre Royal, Bournemouth - Click to Interact. The Theatre Royal, in Albert Road, Bournemouth was constructed by W. Stanley of Bournemouth and opened on the 7th of December 1882. It was designed by the architects Kemp, Welsh and Pindar, also from Bournemouth, and W. Nightingale, from London. The Theatre took almost a year to build, a long time for the period, and cost the not inconsiderable sum of £10,000 to construct and fit out. The Theatre's stage was reported as being 34' wide by 44'6" deep, with a proscenium opening of 24' in 1910. 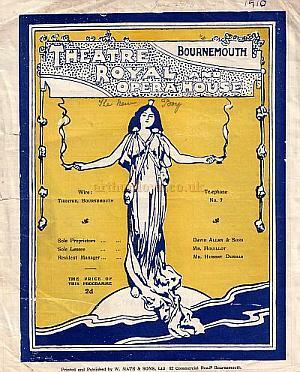 Right - A Programme for 'The New Boy' at the Theatre Royal, Bournemouth in 1910. 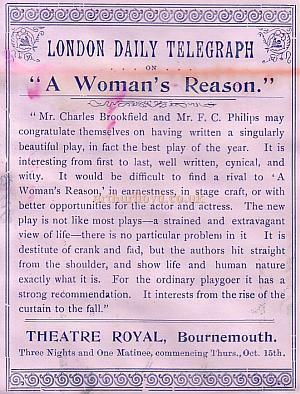 The ERA reported on the opening of the Theatre in their 9th of December 1882 edition saying: '...The decorations have been executed by Mr W. Bevis, of Bournemouth, from designs and under the direction of Mr R. T.. Sims, of London. The gas arrangements have been carried out by Mr B. G. Thompon, of Bournemouth. The upholstery has been supplied by Messrs Crooin and Son, of Bournemouth, and Mr C. Wadman, of Bath, and Messrs Hitchcock and Co., of London. The act-drop and complete stock scenery, including the set scenes for the opening, are from the brush of Mr G. Collier, of Hull, and assistants. The general arrangements of the theatre have been carried out under the direction of Mr H. Nash, who has taken the most recently constructed theatres of London and the continent as his model. The stage is fitted with all the latest improvements and conveniences, and with a view to perfect safety from fire and accident, an unlimited supply of water from the water company's main is carried to various parts of the building, which is throughout fitted with Captain Shaw's regulation fire apparatus, ready for immediate use. The staircase and passages to all public parts of the theatre are fireproof, being constructed of concrete, and are all distinct and outside the theatre proper. All the precautions and regulations laid down by the Board of Works, London, for the safety of the public and for the prevention of fire, have in every case been adhered to and carried out. It is a pleasure to be able to state that the entire building was completed without a single accident or mishap of any kind. The doors were opened for the first time on Thursday last, too late for a full report in this week's issue. The initial performance by the German Reed company passed off with the greatest enthusiasm, and was an immense success. Every available seat had been secured more than a week prior to the opening, and the demand and rush for places on the evening would have more than filled the theatre twice over. We congratulate the lessees and the manager, Mr Henry Nash, on the success, and wish the theatre a long and prosperous career.' The ERA, 9th of December 1882. 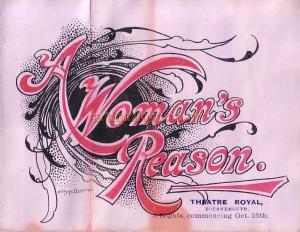 Right and Below - A Programme for 'A Woman's Reason at the Theatre Royal, Bournemouth in the 1890s. The Theatre opened on the 7th of December 1882 but strangely only a few years later it was converted into Bornemouth's Town Hall in 1887. Five years later however, in 1892 the Theatre was refurbished with fittings from His Majesty's Theatre in London and reopened as a Theatre again. A larger foyer was added in 1909. In 1962 the Theatre Royal was converted for Cinema use and then later, despite its Grade II Listed status, in 2008 the Theatre was painted pink and converted into a nightclub. It was later in use as a Comedy Club called Twisters, but at the time of writing in January 2018 the former stalls of the Theatre is in use as a casino called Genting Casino, and the Theatre's former circle is being used as the venue's restaurant. 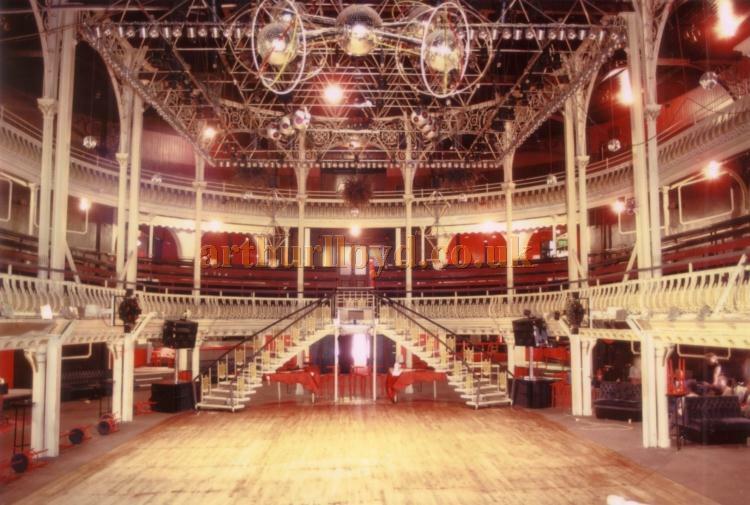 The O2 Academy in Boscombe, Bournemouth is a music venue today but the building's history goes back over one hundred years. 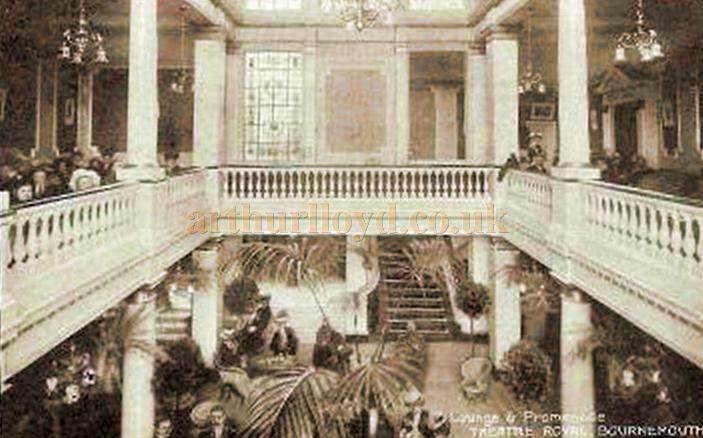 The site started life way back in the late 1800s when it was in use as a venue called the Arcade Pavilion. 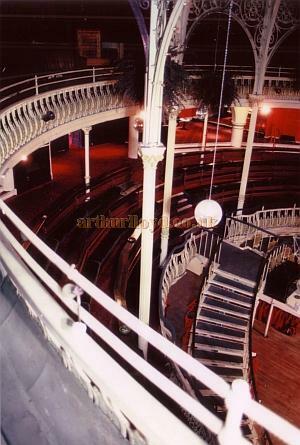 Here various Music Hall style entertainments would be held including singers, comedians, sketches, and burlesque acts. Right - The Auditorium Boxes of the former Grand Pavilion Theatre in 1985 - Courtesy Ted Bottle. In May 1895 a new building opened on the site which was designed by the local architects Lawson and Donkin, and built by Archibald Beckett, who had previously been running the Arcade Pavilion. Construction cost some £15,000. The Grand Theatre and Pavilion, as it was now known opened on Monday May the 27th 1895, with a production of a burlesque extravaganza called 'Crusoe the Cruiser', with Sydney Cooper directing and the piece being conducted by one of its composers, Michael Coznelly. Early appearances at the Theatre included some of the biggest names of the time including Sarah Berhardt, Charles Wyndham, Mr. and Mrs. Kendal, Charles Hawtrey, Edward Terry, Arthur Bourchier, and Wilson Barrett. The Theatre also produced an annual pantomime at Christmas. 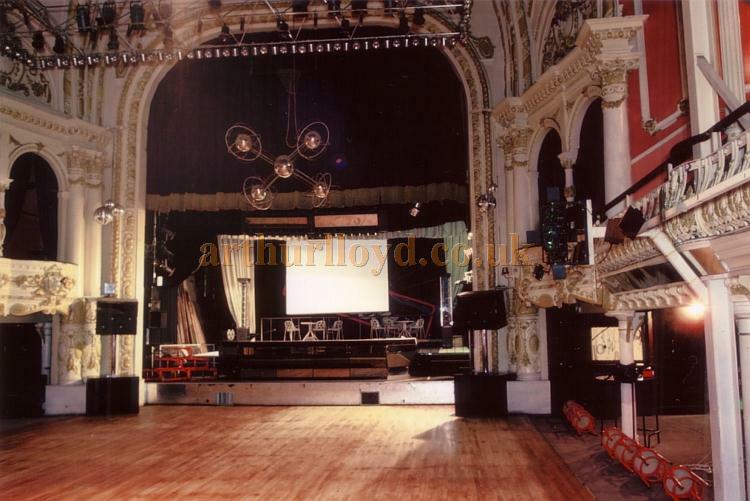 Left - The Auditorium from the Gallery of the former Grand Pavilion Theatre in 1985 - Courtesy Ted Bottle. In 1899 the Theatre had new Lessees and managers, Adria Hall and Robert Ayrton, and was renamed the more simple Boscombe Grand Theatre. In this incarnation it functioned as a Music Hall and was renamed again some years later to the Boscombe Hippodrome. The Theatre was taken over by the Butterworth family in 1945 and they ran it as a touring Theatre until 1957 when it was converted into a Dance Hall called the Royal Ballrooms. This continued until 1972 when it was leased to Mecca and used as a disco. Mecca were later taken over by Rank and they ran the building as a nightclub called Tiffany's. In 1982 the Theatre was taken over by The Accademy who also ran it as a Nightclub, which won several awards for 'Best UK Club'. Later this became Accademy 2 and then the Opera House in the 1980s when acts such as Franky Goes to Hollywood and the Sisters of Mercy performed there. In 2006 John Butterworth took back the Lease of the Theatre and started a major refurbishment of the building. This took six months and cost £3.5 million. The venue reopened as The Opera House and was used a venue for all kinds of entertainment. Today the Theatre is known as the 02 Academy and, despite its long and involved history, and its various uses, is still recognisable as a Theatre, and is protected as a Grade II Listed Building. You may like to visit the Theatre's own website here. 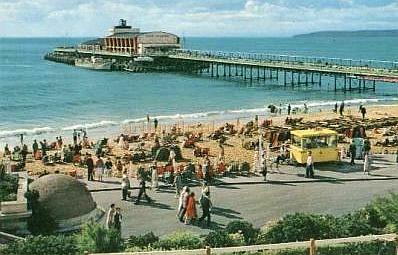 Bournemouth was a different kind of place in 1960. It was still very genteel even though there were holiday makers and you could still hire a bath chair for the afternoon and some one to push it. The holiday makers were very upper crust and all took dinner at their hotels. Therefore twice nightly shows did not work properly even though we did them. No one was going to miss a dinner that they had to pay for whether or not they ate it. The summer shows starring Ken Dodd at the Pavilion (Shown Right - Fom a postcard 1930) and the Beverley Sisters at the Winter Gardens were sold out second house but even if you went down on your knees it was impossible to entice people into the first house that commenced at 6.00p.m. 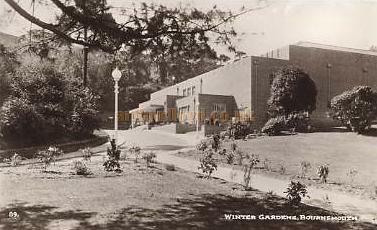 The Winter Gardens (Shown Left) at this time had not been rebuilt and was a concert hall with an open platform for Symphony concerts that took place every Thursday and Sunday Night. We did variety shows on the other nights and converted the concert platform into a theatre stage for the purpose. It was hard work we used to haul tracks with curtains and drapes on them and lighting bars with the lamps already fixed to them to the ceiling hand over hand on ropes through holes in the roof and tie them off on girders in the ceiling void. We put this up twice a week and then took it down twice a week. I think even to this day I still have traces of the calluses on my hands that this work caused. The shows were good and presented even under these difficult circumstances to the same standard as they would have been in any number one theatre in the country. I was the stage manager and worked all the shows dressed in a dinner jacket as was required but I did get a number of complaints about the dry cleaning bills from Harold Fielding because I used to have to re thread greasy wires through winches that pulled the curtains when they came out of their tracks during the performances due to stretching through their continual fitting up and pulling down. The concert platform was high and almost semi circular at the front. With no orchestra pit so we rigged a curtain waist high to the musicians around the front of the stage. During the height of the season the band consisted of twelve plus the musical director and because of the curve on the front of the stage it was difficult for the musicians to follow the beat of the conductor's baton. He used to stand on two beer boxes to give him a bit more height and sometimes stepped backwards and fell off them but they managed somehow. The season started the first week in June and finished the second week in September. For the early and late part of the season we did variety bills and these were the most enjoyable to me with Legendary tops of the bill such as Arthur Askey, Anne Zeigler and Webster Booth and Billy Cotton and his band. Billy's spot always ended with the band playing "I've got a luvverly buch of cocoa nuts" during which the band and audience pelted each other with balls made of tissues that were held in their round shape by two rubber bands. As you can well imagine this meant that a lot of tissue balls had to be manufactured during a week of twelve performances. Fred Coolbar his manager used to obtain tissues direct from the manufacturers that had been rejected for boxing and we all used to sit in the Winter Gardens Café that was also open to the public during the morning and make these balls and put them in large cardboard boxes. You can imagine the funny looks we got from some of the customers. I never see a box of tissues without thinking of Billy Cotton. 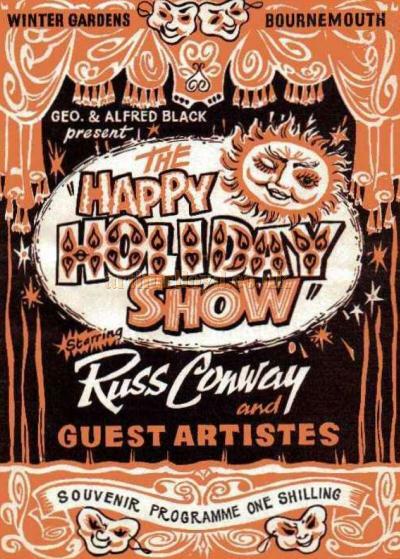 Left - A programme for Russ Conway and Guests appearing in 'The Happy Holiday Show' at the Winter Gardens, Bournemouth in 1965 - Courtesy Carol Faccini. Jimmy Edwards was another regular visitor his most important piece of baggage was a travelling cocktail cabinet because Jimmy was a legendary drinker. He would never leave the theatre on Saturday night with anything left in it. This was against his religion and I used to help him finish the contents after the second house on Saturday night. One of Jimmy's gags was. 'As I was coming in through the stage door tonight one of the band asked me if I could play the violin pitzicato. I told him I could play in any condition.' Amongst the support were a number of comedians who were later to become big names and included Norman Vaughan, Ted Rogers, and Reg Varney. There was also a sprinkling of older comics such as Scott Saunders, Billy Russell, and Ossie Morris and we had great nights at a local pub with lock ins after the show.Some older Artistes appeared on the bills who had been legends of the thirties and included Hutch and Turner Layton who were charming cultured men. Hetty King, the famous male impersonator, came every year she was almost eighty then and had a wonderful act. I fixed her up at my digs and she stayed there on every visit. We used to sit up late into the night with bottles of guiness whilst she regaled me with stories about when Music Hall was at its zenith at the turn of the twentieth century. There were also magnificent continental speciality acts and musical attractions on these bills. I was a very lucky young man to have worked on them. For the main six weeks of the season in July and August we had a static summer show with girl dancers and all the usual production scenes with tops of the Bill such as Dickie Henderson, Hughie Green, and the Beverley Sisters and for three of these weeks the Bournemouth Symphony Orchestra was on holiday and we did not have to take the settings and lights up and down but did Sunday concerts. Harold Fielding refused to pay me for these Sundays because he said he did not ask me for money back from my salary for the nights off I had when the Symphony Orchestra was on. He seemed to forget the putting up and pulling down but I forgive him and thank him for employing me during those great days. 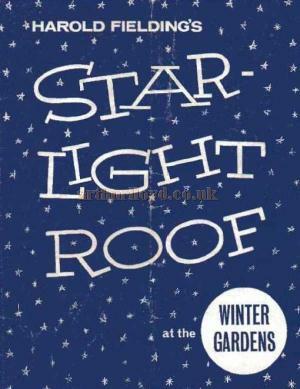 Right - A programme for Harold Fielding's 'Star-light Roof', with Lance Percival, Ronnie Carroll and Winifred Atwell among others, at the Winter Gardens, Bournemouth in 1963 - Courtesy Carol Faccini. The last season I did at the Winter Gardens was for Bernard Delfont in 1967 and by this time the theatre had been rebuilt but was still used as home for the Bournemouth Symphony Orchestra and still had the orchestra tiers at the back of the stage. But we no longer had to do the fit ups and take downs. It was a season that was split between two Bill Toppers Frankie Vaughan and the Seekers. We had a cyclorama cloth hung to hide the concert tiers for the show but Frankie Vaughan did not like this because it deadened the sound. The place was always a nightmare with sound problems. He decided to have the back of the stage open to the concert tiers which were painted a dull green. Bill Roberton the director and myself stayed up all night in order to paint them light blue. I did not want to see another paint brush for months after that. One season, when I was at the Pavilion with Bruce Forsyth for George and Alfred Black, Matt Monroe was topping the bill at the Winter Gardens and on the bill was an excellent girl singer who was rather too fond of the bottle. That year there was a high staircase at the back of the stage and her entrance was down this. One night after a little too much sauce she fell arse over tip from top to bottom of this staircase. Needless to say she made her entrance from the side of the stage after that. It will be a pity too see the Winter Gardens go if the present redevelopment plans go through but unfortunately Bournemouth has too many theatre seats in this day and age of vastly changed holiday habits. I would sadly say goodbye Winter Gardens and thanks for the memories. The Theatre's Trust say in their listing for the Winter Gardens that: - 'In 1999, the local Council invited private developers to put forward proposals for the entire site, retaining the Winter Gardens, but no application was successful. In 2007 demolition consent was granted for the Winter Gardens, and the site cleared in preparation for a new mixed use development, incorporating two new auditoria.' The Theatres Trust. However, this project never reached fruition and the site then stood empty and awaiting an unknown future.